I’m not a big meat eater, but I love how well my husband prepares many meat-based meals. This steak recipe is all his, and it’s easily cooked on the stovetop (with some time in the oven, too) in a cast iron skillet. A pat or two of butter, some herbs and garlic, salt and pepper, and voilà! That’s all it takes to get the steak sizzling and your guests salivating. 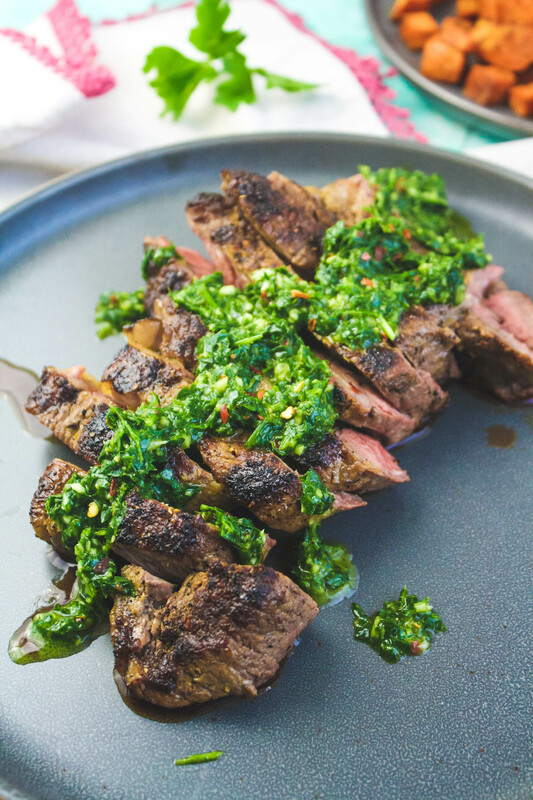 This Skillet-Cooked NY Strip Steak with Chimichurri Sauce is a treat for the senses, and can run anywhere from elegant, special-occasion meal to casual weeknight dinner. Here in Phoenix we can comfortably grill outside right now. Seriously, and no, I’m not rubbing it in! Our payback comes during the summer. 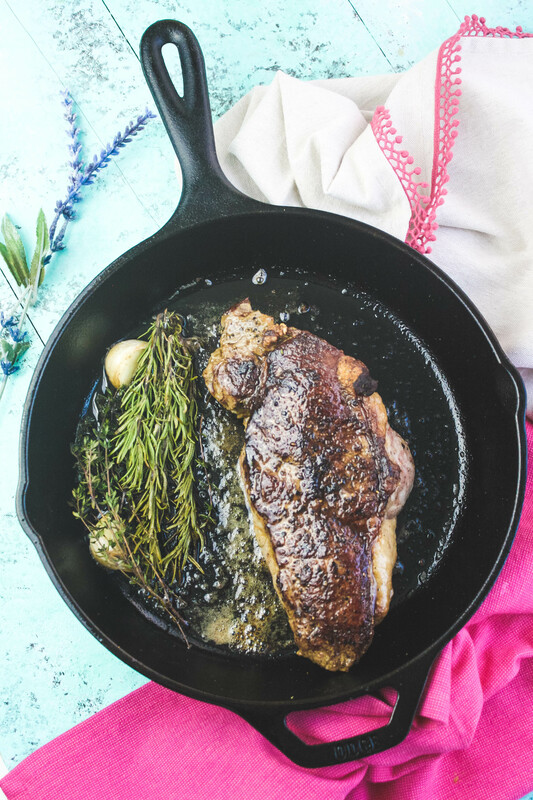 My husband had the idea to prepare this NY strip steak in a skillet so that more of you have a chance to enjoy it like, right away instead of waiting for grilling season! If you’re thinking about dessert as well as your main dish, you can make that in a skillet, too! My Cherry-Almond Skillet Cobbler is easy to make, and super-scrumptious! 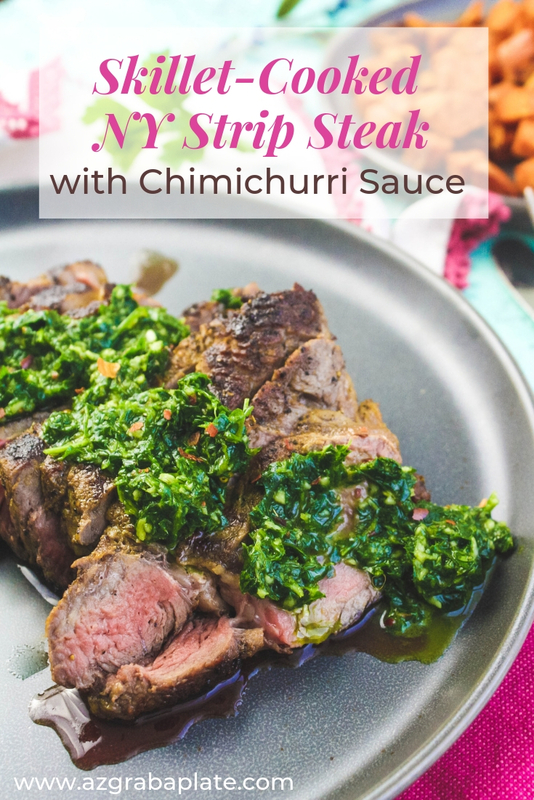 You’ll Love Skillet-Cooked NY Strip Steak with Chimichurri Sauce! 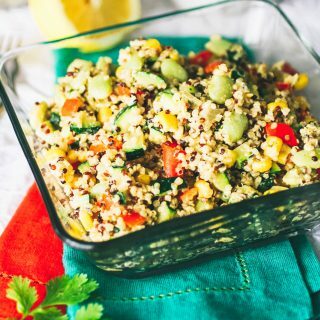 Have you ever tried chimichurri sauce? It’s a simple condiment with big, lovely flavor that you can make in about three minutes. That includes about a minute-and-a-half of whizzing time in a food processor. The main ingredient for the chimichurri is fresh parsley. Yes, the pretty green herb that’s used mostly as a garnish. I have to admit that I was skeptical the first time I tried it. I wasn’t sure how good a sauce could be with parsley as the main ingredient. Chimichurri is most often served as a condiment for beef, but if you want to be a bit of a rebel, try my recipe for Chimichuri Pasta with Grilled Spicy Shrimp. I could eat it on so many things! Speaking of shrimp, keep this recipe for Grilled Spicy Coconut-Lime Shrimp Skewers on your radar once grilling season hits. 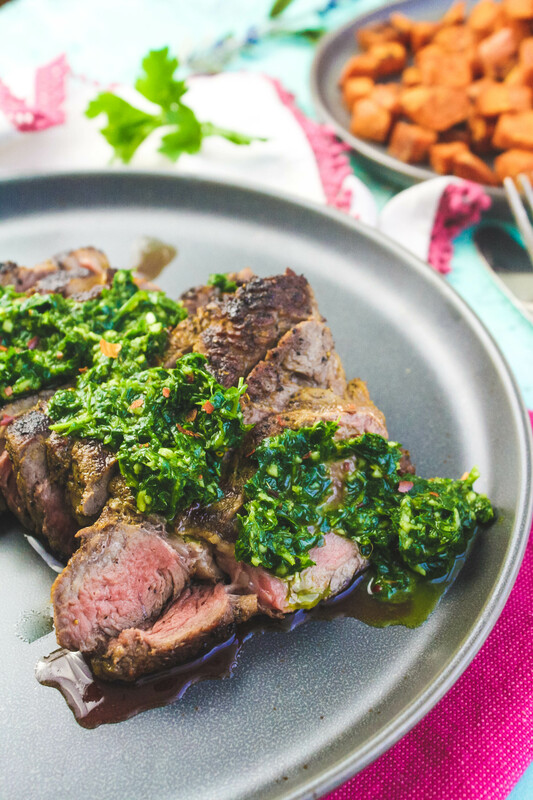 Skillet-Cooked NY Strip Steak with Chimichurri sauce is simple in its ingredients and simple in its prep, but it’s BIG in fabulous taste. Make this dish part of your next meal. Pat the steak dry with paper towels. Use your hands to rub the oil over the steak and season with the salt and pepper. 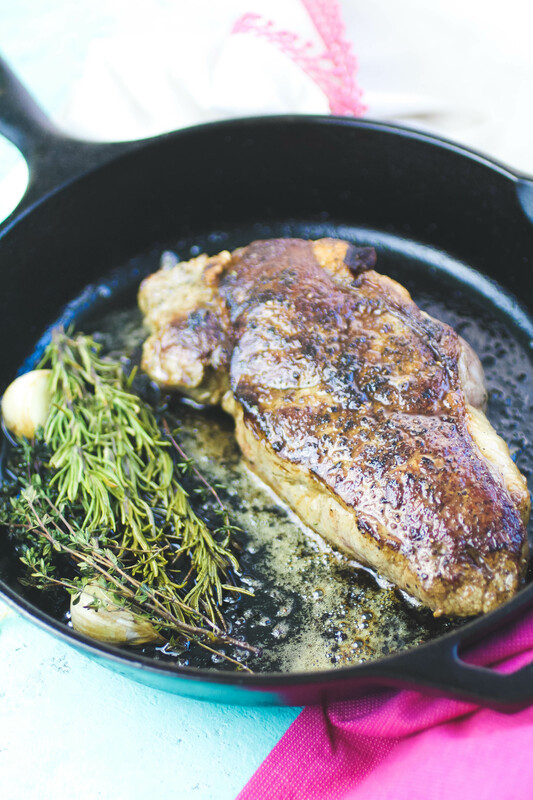 Place a seasoned cast iron skillet over high heat. Once the skillet smokes a bit, add the steak and cook for one minute. Flip and cook for another minute. Remove the skillet from the heat. Add the rosemary, thyme, garlic, and butter, and place the skillet in the oven for three minutes. Remove from the oven. Flip the steak and spoon the melted butter over the top of the steak, and return to the oven for another three minutes. Remove from the oven. Keep the steak in the skillet to rest for five minutes or so. 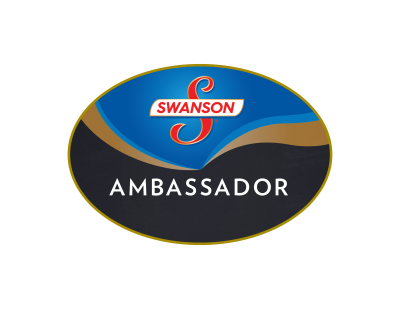 *Note that the U.S. Food and Drug Administration recommends beef is cooked to an internal temperature of 145 degrees F. as measured by a meat thermometer (including a three-minute rest time). 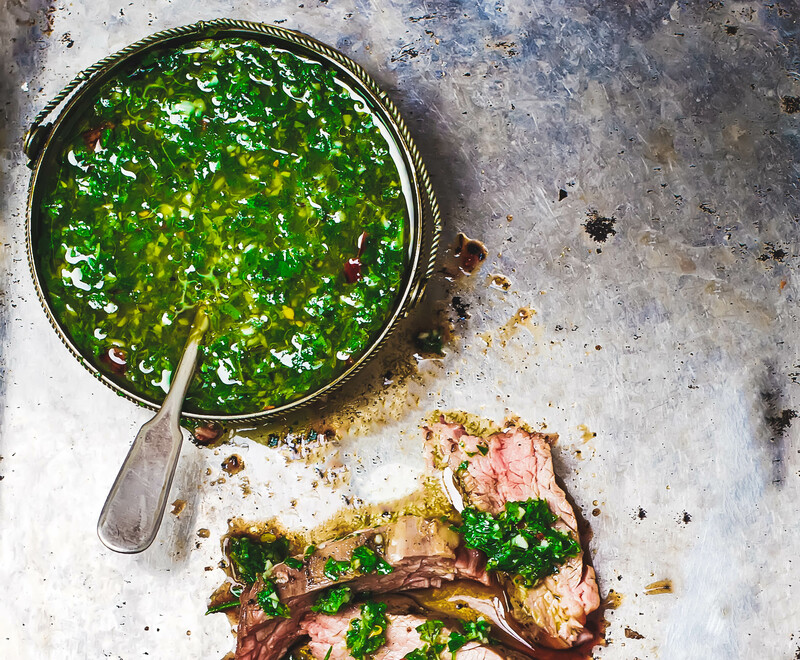 Slice the steak and serve with the chimichurri sauce spooned over the top. 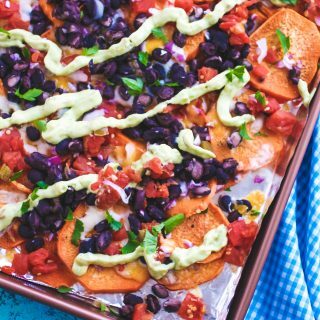 That chimichurri sauce sounds perfect for this! Looks great for a date night in! This is one of my husbands fav to have out. 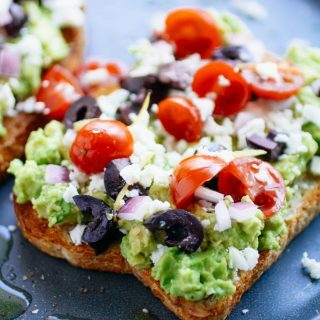 Thanks for the easy recipe to do it at home! Oh, awesome, Tiffany! Hope you're able to make it for a night in! I love how some of the simplest things have the best flavor! Definitely a win especially since your husband handles it all. I'm with you! Thanks for stopping by, Sabrina! This sauce looks like the perfect combination with that steak! Thanks, Amanda! 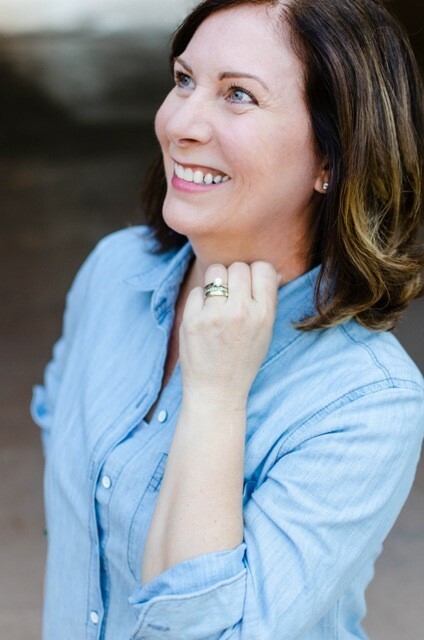 I love the chimichurri on steak and other dishes, too! Thanks, Leigh! I know -- me, too! Yes, for sure, Dawn! I hope you give this a try soon, and enjoy! My husband loves a juicy steak for dinner! Can't wait to surprise him with this! Oh! That's so nice! Hope he totally enjoys it! That chimichurri looks AMAZING! So fresh and flavorful! Thanks, Taylor! It's such a great topping! I am not a big meat eater myself but damn, this looks so good!!! Thanks so much, Joy! Once in a while is fine with me! Ok this looks absolutely amazing! Oh my! This is my kinda dinner!